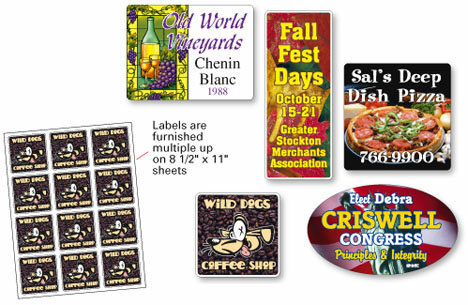 NEW - QuickShip Digital Custom Printed Labels - LOW PRICES ! Elite Design introduces our new Quick and Colorful Custom Digital Label program. These new dazzling, full color labels are now available in 24 of our most popular shapes and sizes and ship in 1-2 days! We have also added a NEW Value Line of custom digital printed labels that offer affordable prices on full color labels in 3-5 working days. With quantities from as low as 250 to 10,000, our new short run, quick ship digital labels program can meet all your needs. These custom digital labels feature vivid, full color, high quality printing. Your message is sure to get across in a big way. Quick and colorful labels are ideal for small retail businesses, ingredients labels, branding labels, short term promotions and much more. • White gloss paper with permanent adhesive. Furnished multiple up on 8.5x11 sheets. Labels per sheet vary based on size. Full Color Custom Digital Labels Prices- effective until Dec 31, 2018 - PLEASE CALL OR EMAIL FOR CURRENT PRICING! For larger quantities, additional shapes/sizes, or for information on something you do not see here, please contact us. FREE Professional Design Services - If you don't have a design our graphic design team can create a design from your specifications. We email your custom label proof to you to review and our design servcies are free of charge. Elite Design specializes in Short Run Digital Custom Labels Printing. If you do not see a size above that you need or have questions concerning our Custom Digital Labels use our contact form to send us an email and we will reply back promptly.